From our Premium collection, our Amazing New Fishing Gnome on Boat is one of the nicest gnomes we've every carried. Incredible detail, this figurine is a work of art for the most discriminating gnome collector. Gone Fishin' is the the only motto this Gnome lives by. 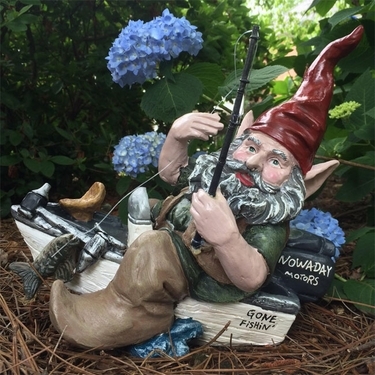 For the fisherman who always has fishing on their mind, this awesome fishing gnome continues the fun all year long. Fishing pole in hand with line, and what's that - it looks like he got a bite too!